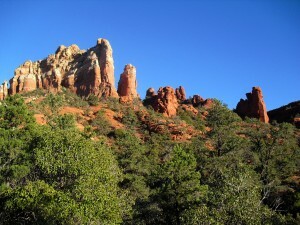 Planning a visit to Sedona? 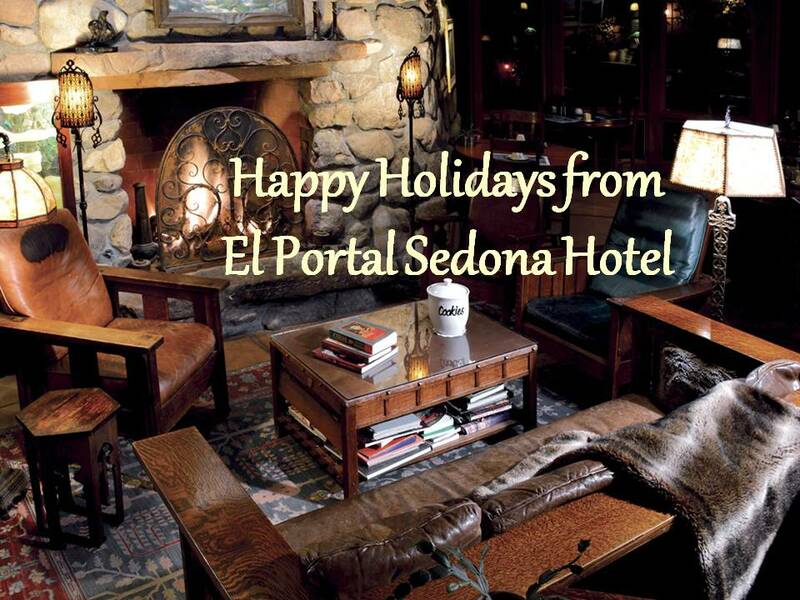 Let El Portal help you make the best of your Sedona Arizona vacation! Read what some of our guests think and feel about us! This was our first time staying here (in the Rim View room) and it was truly wonderful. The inn is thoughtfully constructed and designed, and decorated with beautiful unique arts and crafts pieces that Steve and Connie have picked up at antique shops. There were four of us in the room and it still felt spacious and the beds were very comfortable. We also enjoyed the all natural toiletries. Sedona is an outstandingly beautiful place to visit and after a long day of activities El Portal was such a lovely and relaxing place to return home to. I loved sitting by the fire at night–there was one both outdoors and in– and the food- both the breakfasts as well as the snack food– was delicious. Steve and Connie are very gracious and interesting to talk to. Room Tip: Ask Steve about the best room for your needs and preferences. This beautiful, secluded, and relaxing respite was absolutely perfect for a weekend get-away from the Valley during the hottest weekend of August. The owner of El Portal, Steve, was welcoming and full of information as he guided hubby, myself, and our Aussie straight to our room. Yep, it’s a dog-friendly or I should say dog-welcoming place. Perfect! Cool flagstone flooring with enormous exposed woodbeams acorss the ceiling; masterfully tiled bathroom with a walk in shower and tiny jacuzzi tub and copper sinks. Super cozy, and it even had a patio. The happy hour refreshments were delicious – skip the quesadilla and focus on the olive mix and homemade salsa – wow! 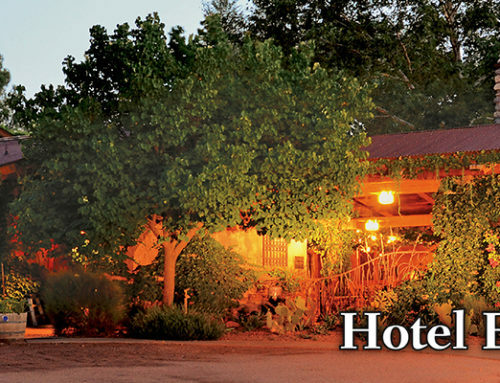 This intimate lodging is within walking distance of both Tlaquepaque and its beautiful shops and the touristy shops of downtown Sedona. The scenery is second to none and I couldn’t be more relaxed! Thanks El Portal! What a relaxing property. Calm and serene, the rooms are spectacular and the decor is world class. You won’t want to leave the hotel. Why stay at an ordinary hotel when you can stay at El Portal, a luxury boutique hotel! 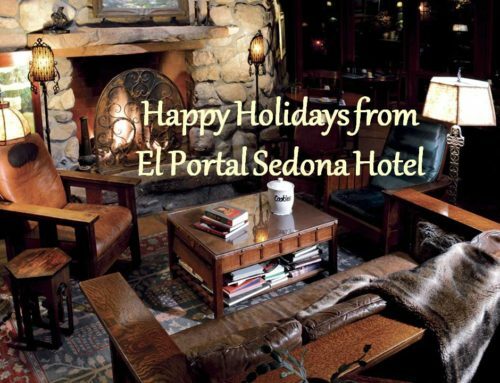 El Portal is located in the heart of Sedona; less than two hours from the Grand Canyon, close to local, award winning wineries, great hiking trails, Oak Creek, and more. The staff at El Portal can help you with all your daily plans, from jeep tours to balloon rides, shopping and dining to “doing” the Grand Canyon. 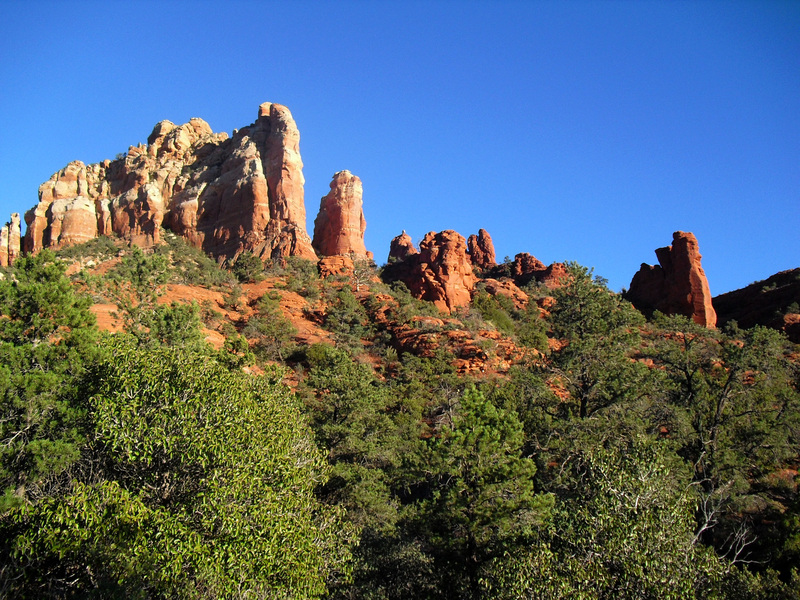 Check out our online Sedona Hotel packages! Stay at our luxury inn and make your trip extraordinary!